Throughout the year, Christenings (also called 'infant baptism') take place at Christ Church Thornton. They usually take place on a Sunday at 12.30pm. There is such a demand that dates are often booked up months in advance. Before setting your heart on a particular date, please come along to a service at Christ Church, where you can meet the church family and participate in worship. 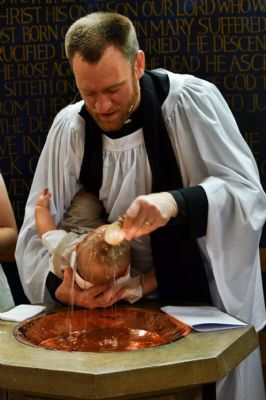 The words of response spoken by parents at a baptism service include a commitment to help their child find their place within the context of the church community. This means - coming to Church! So if you're wanting to have your child baptised, please start as you mean to go on - come to Church. There are so many ways you can do this. Most parents find the Sunday afternoon 4.30pm 'Treehouse' service a great way to start. Treehouse is informal, contemporary and child-friendly. You'll be greeted with fresh filter coffee on arrival, along with a selection of biscuits and cakes. During the summer months we have Wallings ice cream straight from the freezer at the end of the service! Come along to Treehouse, meet Damian the Vicar, and he will have a brief chat with you about the process of booking a baptism. Stage 1 - Come along to Church and afterwards have a brief chat with Damian to book in a date for the planning meeting. Stage 2 - Planning meeting at the Vicarage, to explore why you want your child to be baptised, available dates, and to receive a booking form. A date for the baptism will be pencilled in and reserved in the Church diary at this point. The baptism booking form which is required before the date for the baptism is finalised, is available below to download and print. Please do not return this form until Stages 1 and 2 have been completed.